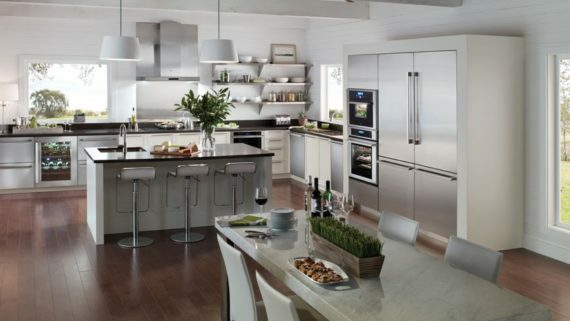 For over a hundred years, Thermador has been producing exceptional, luxury appliances. 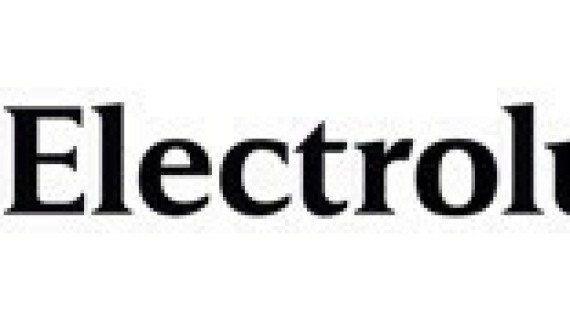 The brand introduced the Cooktop to America and rolled out convection and steam ovens. Thermador appliances are designed to empower cooks to create an unforgettable experience in the kitchen, and so many home “chefs” will be particularly excited at the prospect of Universal Appliance and Kitchen Center in Calabasas and Thermador being a major part of this year’s Wine & Food Experience at the Camarillo Hangar in Camarillo CA November 10th, 2018. The Wine & Food Experience is a celebration of all things culinary, allowing visitors to sample wines, food, restaurant offerings and much more. There are bands, dancing, pubs and boutique shopping that will let attendees enjoy a variety of craft brews, ciders, wine paraphernalia, accessories, and clothing as well as a silent auction with some enticing items being offered up. 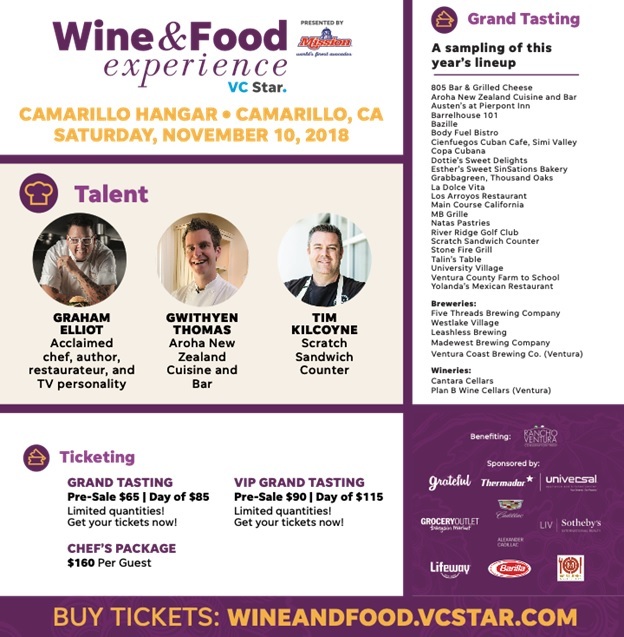 At the November 10th Ventura County event in Camarillo, guests will not only be able to sample some fantastic food and wine, but also a number of cooking demonstrations. 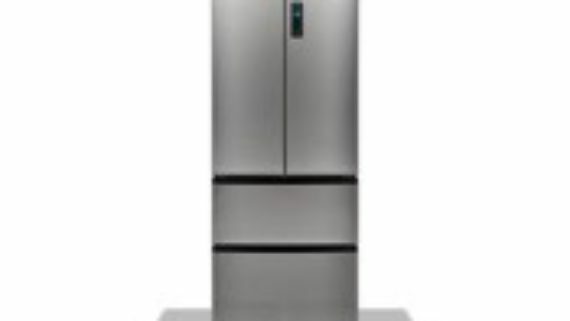 Universal Appliance and Kitchen Center and Thermador are sponsoring the Culinary Stage, which is a prime kitchen demonstration outdoor venue. 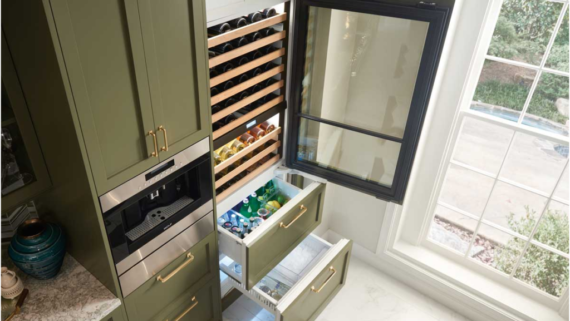 Attendees will be able to get a sneak peek, up close and personal, at Thermador’s new collections PRO and MASTERPIECE, which boast 300 new products, the largest new introduction in the company’s century plus history. Not only will attendees be treated to an eclectic collection of the most exceptional food, craft beer and wine native to Ventura county, but this exciting event will also provide access to some other fantastic demonstrations. Celebrity chef Graham Elliot will be leading a cooking demonstration preparing a Cheddar Risotto with Green Apples and Crispy Bacon with Q&A and a special ticket to a private program with a meet & greet. Aroha New Zealand Cuisine and Bar Chef Gwithyen Thomas will also offer a cooking demonstration. The CAF (Commemorative Air Force) Museum, whose reason to be is to showcase the history of aircraft from World War II for future generations, offers up a fantastic setting, allowing event attendees not only an amazing gourmet experience, but also to experience vintage aircraft displayed throughout the Grand Tasting space both indoors and outside, for a visually unique, culinary sampling event. The Ventura County Wine & Food Experience is presented by Mission produce and benefits Rancho Ventura Conservation Trust. The Trust purpose is to protect scenic open space, agricultural vitality and the natural diversity of the ranch and coastal areas in Ventura County. For this reason, Universal Appliance and Kitchen Center and Thermador are proud to be providing additional support as a sponsor, joining other exciting brands including Grateful & Co, Sotheby’s International Realty and Barilla to name a few. With brands including Camillo’s Cantara Cellars and Ventura Coast Brewing Company, event attendees are sure to sample some of the best food, wine and craft brews the region has to offer. Be sure to follow #VCWFE or @usatodaywinefood on Facebook and Instagram for full event highlights and features. For tickets go to www.wineandfood.vcstar.com Universal Appliance and Kitchen Center and Thermador are offering $10 off GRAND TASTING tickets by using promo code UNIVERSALAPPLIANCE. There is also the option of VIP admission that not only provides access to the entire general admission features and grounds, but also offers exclusive access to the VIP Lark Lounge with a special choice of brew, wines, and food to create your own private beach party. VIP admission also offers shaded seating, other amenities and early entrance to all areas. 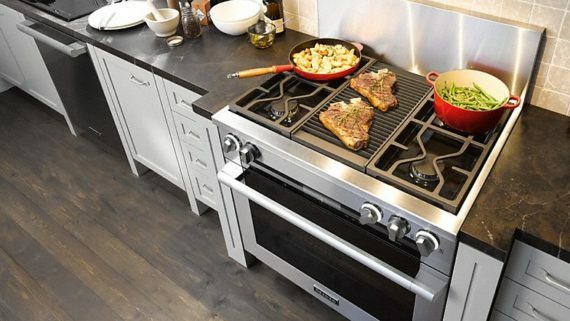 Universal Appliance and Kitchen Center Calabasas Showroom, serving the Camarillo and Ventura County area is at 26767 Agoura Road Calabasas, CA 91302 (818) 880-0011 Monday – Saturday: 9am to 6pm Sunday: 11am to 6pm and is offering special Thermador promotions.